I used the Father’s day weekend this year to take a break from my normal weekly writing routine. Truth be told, I spent most of the weekend at a baseball park both as a volunteer and as a dad enjoying the game. I didn’t leave a block of time for thinking and writing as I usually do. As I reflect on Father’s day today I’m thankful to be a dad and to have a dad. It’s an important role in the life of a family. I can see now just how much of who I am was influenced by fatherly figures (for better or worse). So it’s not unusual that I feel that I don’t do enough as a dad. I wish I could focus more on quality than quantity. I wish I could relate better to the thinking of a child and young adult’s mind. I wish I could be the dad my kids need as much as the dad they want to have. I hope when my kids reach my age that they see I always acted for them and with them for the sake of love and guidance. So here’s a celebration for dads. Happy Father’s day and thank you for the work that creates memories. Thank you for the guidance that molded me. Thank you for believing in me. I’ll always remember. I had the privilege of spending a week in Cooperstown New York this past week watching 104 teams of twelve year old boys play baseball. It was a bittersweet time for me because I love the game of baseball so much, but it was the last time my son would play youth baseball before moving up to an older and bigger league. I wrote these thoughts after the last game as a tribute to baseball and the Cooperstown Dreams Park experience. There is a special magic to 12 year old baseball. It’s the pinnacle of a child-hood game that captures the transition from the innocence of youth to adolescence. It’s the basis of our national pastime wrapped in a set of emotions, experiences, and memories. This is a game that’s bigger than any player, any coach, and any fan. Youth baseball captures our hearts for a time and leaves permanent impressions that become part of the fabric of our being. A view from behind the plate on one of the 22 fields. The Cooperstown Dreams tournament is about more than wins and losses. To describe this experience, it’s best to see it through the eyes of a twelve year old. It’s a players moment that starts in a locker room that makes them part of a brotherhood. The colored stockings, the laced cleats, and the cap make more than a uniform, they capture a team. 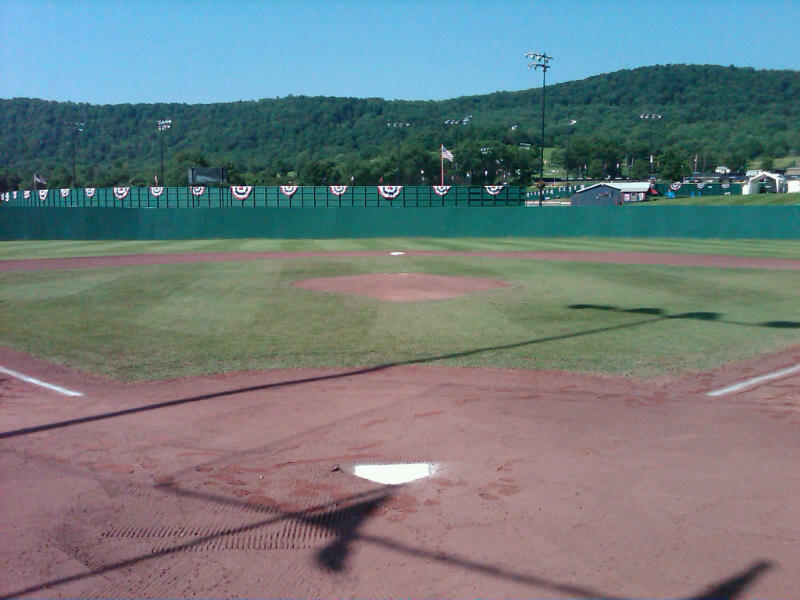 The fields at Cooperstown Dreams Park create a big league feel. The grass is full and without bald spots or weeds. The bases are painted white before each game. 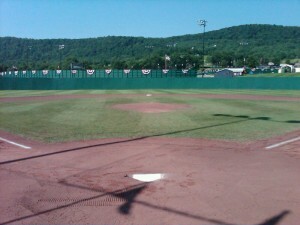 The foul poles are clearly visible and distance markers painted on the outfield fences. The infield dirt is softened with water before each game and there’s grass inside the base diamond that’s level and cut low. The voices from the stands are encouraging, but more-so those of a teammate. Baseball team chatter may sound like jibberish to the untrained ear, but to the player it’s a pick-me-up, an encourager, and a reminder that you are not alone. Their memories are not about which player batted first, played a certain position, or the innings they played. No, their memories are from walking up to the plate and seeing the eyes of the opposing pitcher. Their memories are from hitting the ball, stealing a base, or making a catch. Their memories are about their teammates and the opposing teams. This is a game for players and playing the game is about the total experience. The smells, the sounds, the uniforms, the chatter, and the other players all contribute to the magic; as if it could be captured with words. The things a fan sees such as the batting order, innings played, and the scores of the game are only remembered because a scorer records it on paper. But the paper is just a small part of the reflection of the player’s memory. The details and stats from the paper are the subject for debates, records, and legends. It’s what players talk about when they don’t play any more. Thanks for the memories boys. You’re part of a brotherhood now. Thanks for playing hard and giving your best this week. You’re taking away memories that one day you’ll share with your sons. That’s just part of the complete experience. Love the game. Live the game.